Erlinda D. Grefiel, 50, has been working as a *Barangay Health Worker in the Philippines for nine years. She is a resident of Barangay Odoc, married to a fisherman, and the proud mother of nine children! 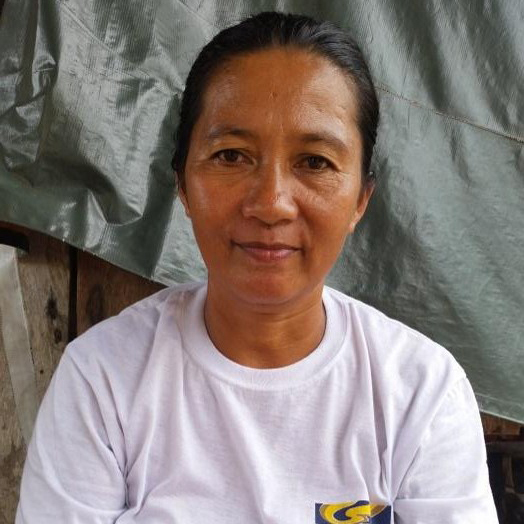 In her years as a health worker, Grefiel saw many of her neighbors suffer from various illnesses due to their lack of knowledge about health and sanitation. These poor health conditions existed even prior to the devastating 2013 impact of Typhoon Haiyan. Being a health worker I was worried about how I can help the people, how can I prevent them from being sick,” Grefiel said. She even came face to face with death as she almost died during typhoon. Getting a second chance at life made her realize that she has a purpose and responsibility. When Food for the Hungry (FH) Philippines came to her community looking for Cascade Group volunteers, she eagerly signed up. Six months has passed since then, and Grefiel continues to enjoy serving others as a Cascade Group volunteer. Doing home visits, teaching and observing her neighbor circle members as they slowing change their health practices makes her realize how important her role is to her community. I will never get tired of assisting others towards wellness. I cannot afford to do nothing when I know I can do something. Being a Cascade Volunteer teaches me many things, it increases my knowledge about health, it makes me more aware of the things we should do to maintain a healthy environment. *A "barangay" is the smallest administrative division in the Philippines and is the native Filipino term for a "village." It is used to designate a neighbourhood or community.